You might think they're boring, but take a look at the dividend growth potential and you might be surprised. I want to talk today to a specific audience: current or soon-to-be retirees who have done a great job of saving for retirement but don't want to see their nest egg disappear as they enjoy their golden years. The backbone of any retirement portfolio is a collection of solid, dividend-paying stocks. It's all the better if those stocks are relatively low-risk. Here I'm going to look at three different stocks that are as boring as they get. They deal with soup, jellies, and paint, among other things. But for low-risk investors, boring is good. And so is an uber-safe dividend payout. That's why I think all three of these are worthy of consideration. And if you're in doubt, these three stocks -- J.M. 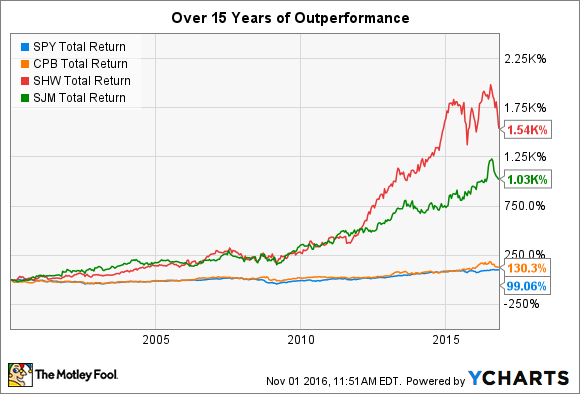 Smucker (NYSE:SJM), Campbell Soup (NYSE:CPB), and Sherwin-Williams (NYSE:SHW) -- have absolutely smashed the S&P 500's return of 100% since 2000. Ever since Andy Warhol started using Campbell Soup as a trademark image, the company has been ingrained in America's consciousness. While the company holds a 59% market share of "wet" soup sales in America, it's branching out to meet the next generation's eating habits. Over the past decade, it has -- via acquisition -- pivoted its focus to include carrots and health smoothies (Bolthouse Farms), salsa, chips and hummus (Garden Fresh Gourmet), and organic baby snack food (Plum Organics). Those moves are important: While the core soup business has a sturdy moat around it, the company needs to use the cash from this segment to make sure it moves from the middle of grocery stores -- where many of yesterday's shoppers made their purchases -- toward the outside, where fresher foods are more readily available. The good news for investors is that not all of that extra cash is going toward acquisitions. Campbell offers a 2.6% dividend yield and used just 35% of its free cash flow over the past year to make the payout. That means it's very safe and has lots of room for growth. It's hard to express just how successful Sherwin-Williams has been in the paint business. Shares have advanced a whopping 1,500% since 2000. It's the third largest paint company in the world, and it's set to move into second place when its merger with Valspar is closed. The good news for investors is that people will always need paint -- if not because their old paint is breaking down, then because they want to change the color of a room or house. The company's dividend is both healthy and underappreciated. I can understand why some might scoff at a 1.4% yield, but this doesn't tell the whole story. Over the past year, only 23% of the company's FCF has been used on the dividend. And the payout has been growing like a weed: For 36 consecutive years it has increased, and over the past five years it has increased at an average pace of 17% per year. If that trend continues and you hold the stock for a full decade, you'll be getting a 6.7% yield on your original purchase in 2026. Smucker is known in households across the country for its eponymous jellies and jams. But there's much more to this food conglomerate: Jif peanut butter, ice cream toppings, Crisco, Hungry Jack pancakes, Santa Cruz organics, and Folgers coffee, to name just a few. The important thing to note with these brand names is that they're all staples that will probably still be purchased even during economic downturns. That adds a level of safety that retirees like to see in their nest eggs. And it also has a modest 2.3% dividend yield. Like the other two companies on the list, Smucker uses a small amount of its FCF -- 23% -- to make the payment, meaning it's very safe and has lots of room for growth. And while the price tag of 20 times earnings might look expensive, the stock actually trades for just 13 times FCF, which makes it appear to be a much better deal than you might think. Of course, there are lots of dividend stocks out there that could fit in your portfolio, but I believe all three of these deserve some consideration. They offer iconic brands with solid dividends with tons of room for growth.